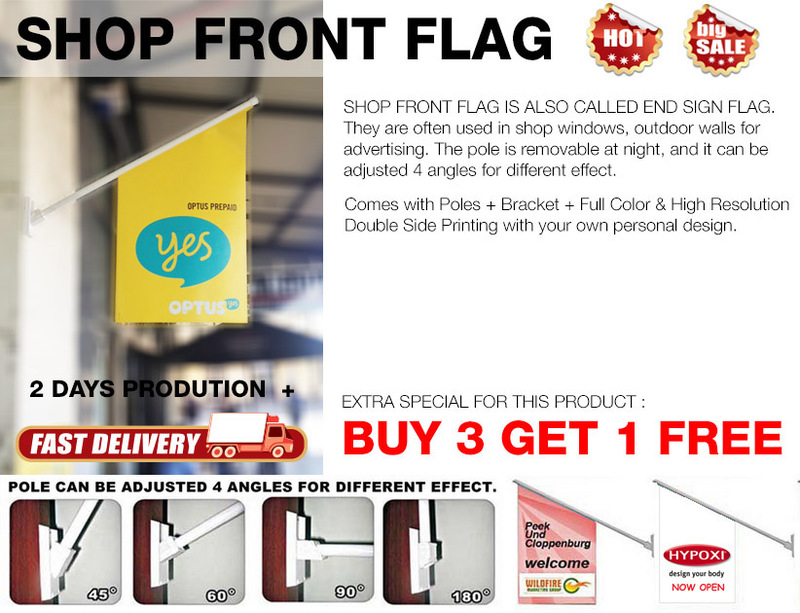 End sign flag is also called Shop front flag and POS flag (Point of Sale Flag).With the elegant appearance, End Sign Flags are widely used as shop windows banners, hand flags , point of sale flag, marquee advertising flag, wall advertising flag.Our high quality end sign flags will boost your business promotion and increase your point of sale promotion. FULL COLOUR GRAPHIC PRINTING INCLUDED. 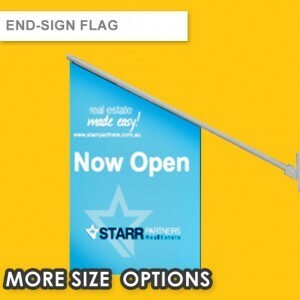 OR DETACHED AS A EVENT HAND FLAG. OUR SPECIAL HEAVY DUTY DOUBLE SIDE FOAM TAPE IS IDEAL FOR INSTALLATION ON GLASS / TILES OR OTHER HARD TO DRILL THROUGH SURFACE. IT ALSO WORKS ON MOST OF GLOSS SURFACE AS WELL AS ROUGH BRICK AND CONCRETE SURFACE. INSTALLATION RESULT WILL VARY ON DIFFERENT SURFACE. INSTALLATION AREA MUST BE FULLY CLEANED AND DRIED UP BEFORE INSTALLATION. 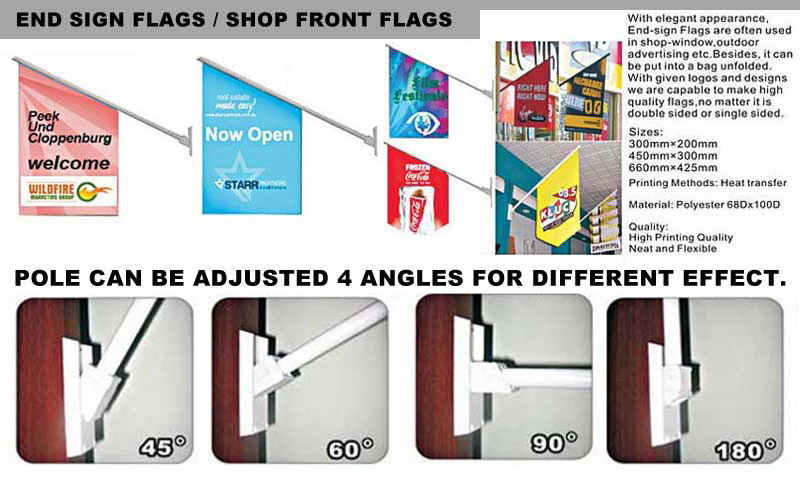 AFTER INSTALL THE BRACKET WITH FORM TAPE, PLEASE ALLOW 24 HOURS BEFORE YOU ATTACH ON THE FLAG POLE, SO THE FORM TAPE CAN CREATE STRONG ADHESIVE BONDING. 1.Select the size & quantity of your order, and complete the order online. 2.We send you back the template to set up artwork. 3.We start the production once the artwork is confirmed.